Under the new Farm Innovation Visits scheme, managed by DAERA’s College of Agriculture, Food and Rural Enterprise (CAFRE), potato growers will visit potato stores in the Perth and Aberdeen area that are currently using a variety of ventilation systems for both seed and ware crops. Dr Stuart Wale, a potato researcher and consultant with SRUC will be providing specialist support and help the group consider the merits of the different systems. 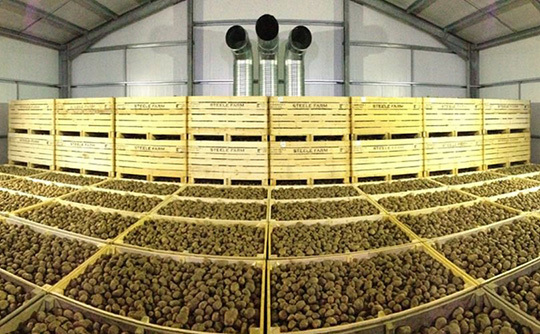 Potato storage is a costly investment – it is important to manage stores properly. The group will leave from Belfast International Airport on Wednesday 23 January and will return on Thursday 24 January and will be led by CAFRE advisers Robin Bolton and Aveen McMullan. Fiftteen places are available and these places will be awarded on a competitive basis. Applications close at 3pm on Tuesday 18 December 2018.